After a process which ran for approximately 15 months, the proposal from the Spanish-Canadian consortium CAF-THALES won the tender for the supply of 185 new cars with HVAC (115 for Line 3 and 70 for Line 6), the CBTC automatic driving system and rolling stock maintenance. The consortium’s bid considered supplies for a value of US$ 336,450,115 plus UF 511,206. Maintenance and spare parts, amounting to US$ 19,101,905 and UF 1,650,177, are added to this. The resulting total value of the contract is equivalent to US$ 451,861.220. “We are very pleased with the outcome of this public notice. The construction of the new lines 3 and 6 represents the biggest challenge we have faced as a company, not only because we are building in parallel, but also because we are incorporating best practices globally, technology and the latest innovations to deliver the best possible service to the residents of the 11 municipalities that will benefit from this project. 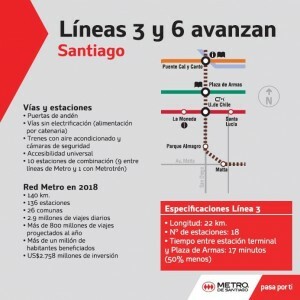 And the bid has been awarded fully complies with the magnitude of this challenge,” said Metro General Manager Santiago Ramón Cañas. “One of the prominent features in the winning bid is the art energy efficiency representing more passengers with less power consumption. In this way, the new cars will have a capacity of 260 passengers, higher than the current offer trains already operate on the network. This means that energy efficiency (kW / passenger carried) is higher by about 40 % at the last trains with air conditioning added to the fleet. This way, Metro de Santiago is reinforcing its commitment to the efficient and responsible use of resources, managed in the best possible energy consumption in its operations”, he added. Lines 3 and 6, now under construction, will have driverless trains, steel-wheels, air-conditioning, onboard CCTV and passenger information systems. Stations will have platform screen doors.